Some foods have a way of slipping under your radar, despite rocking your world every time you revisit them. Tomatillos are firmly in that category for me. Tart, tangy and refreshing as they are, tomatillos can be tough to wrangle up in Madison outside of their main growing season (May-October) and are often tucked away in ethnic or specialty sections of the produce department. As such, they’re regretfully out-of-sight, out-of-mind on many of my grocery runs. Thankfully, warm weather means my fridge has a steady supply of fresh salsa for snacking and salsa verde is one of my favorites so this illusive green-husked fruit is back in my life again. 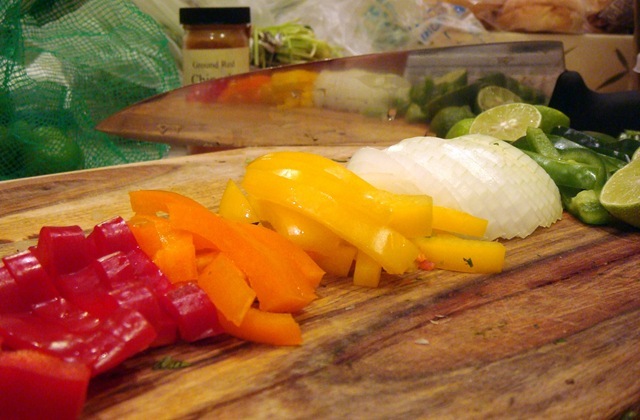 Mexican food is so great because of the fresh, bold flavors and often simple preparations. If you know my style in the kitchen, you know that’s precisely how I operate. While this isn’t the quickest dish to whip up with the roasting and simmering involved, the crisp waves of flavor from the tangy tomatillos, spicy peppers and fresh cilantro make the effort well worth it. Place prepared tomatillos and poblano pepper on a baking sheet and roast under your broiler for 6-8 minutes or until the skin begins to blacken in spots. Flip and repeat. Place roasted tomatillos and poblano pepper in a blender or food processor along with chipotle pepper, cilantro, garlic, stock or water, lime juice and seasoning. Blend until well-incorporated into a smooth sauce. Add vegetable oil to cast-iron skillet over medium-high heat. Sear chicken thighs for 3-4 minutes on each side, until browned and crisp. Set aside. Sauté peppers and onion in reserved oil and chicken drippings for 6-8 minutes, or until softened yet still firm. 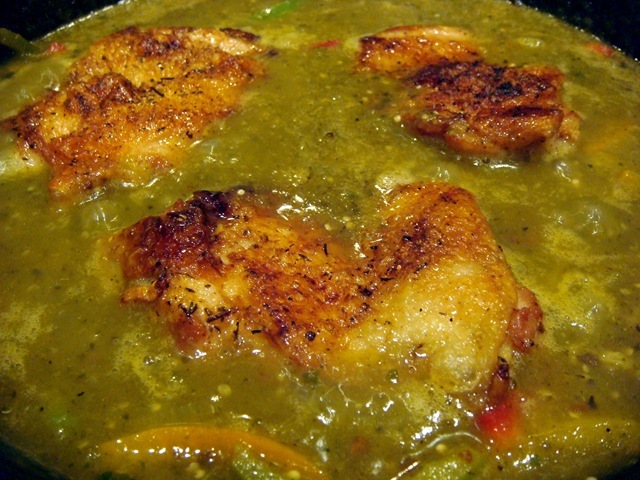 Add prepared tomatillo-poblano-cilantro sauce to pan along with seared chicken thighs. Reduce heat to low and simmer for 15-25 minutes until sauce has thickened and chicken in tender. 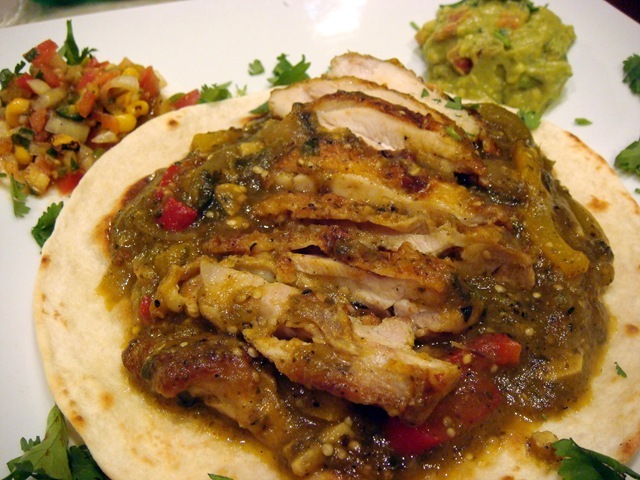 Serve on a warm tortilla, preferably with some delicious accoutrement like sour cream, guacamole, and fresh salsa. I happened to have some pineapple-roasted corn salsa and fresh guac on hand, which added cool, refreshing counterpoints to the warm, tangy sauce. If you’re not on the tomatillo bandwagon yet, you should be. This platypus of the tomato family has a lot going for it if you can track it down. It looks so yummy. I like the way chicken looks like it’s gonna melt away. Thanks for sharing.